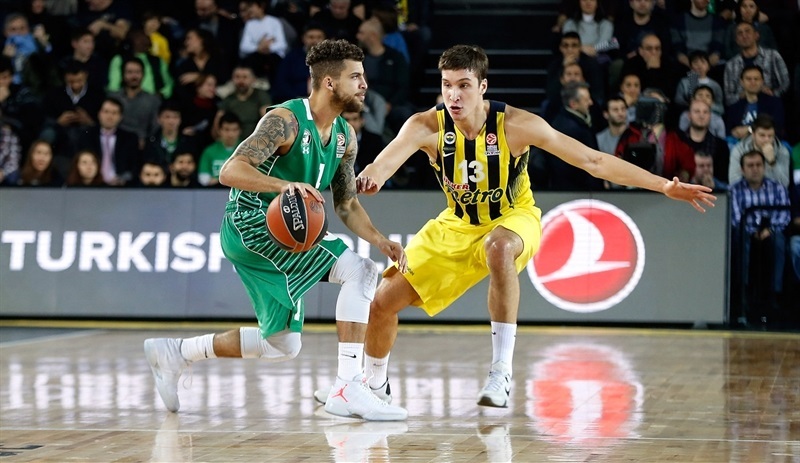 Fenerbahce Istanbul scored the second-most points in club history and the most ever on the road on Friday night and would need almost all of them to beat Darussafaka Dogus Istanbul 100-106 at Volkswagen Arena. 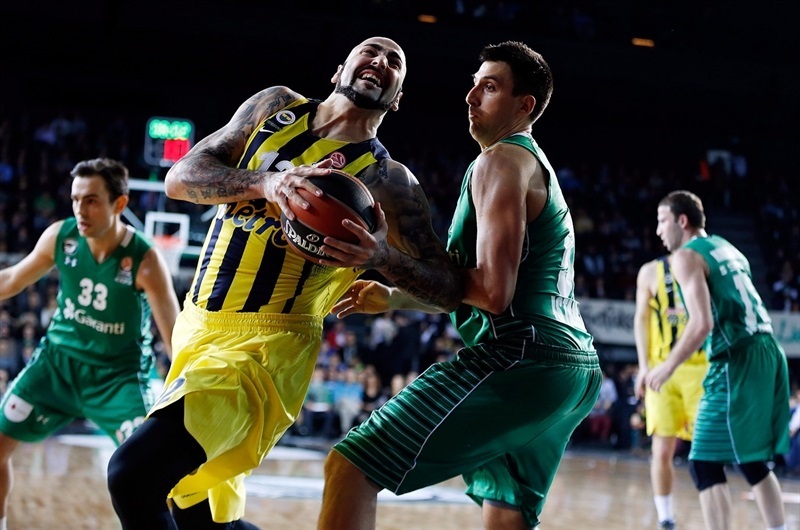 Fenerbahce remained undefeated in four Top 16 games, while Darussafaka dropped to 0-4. 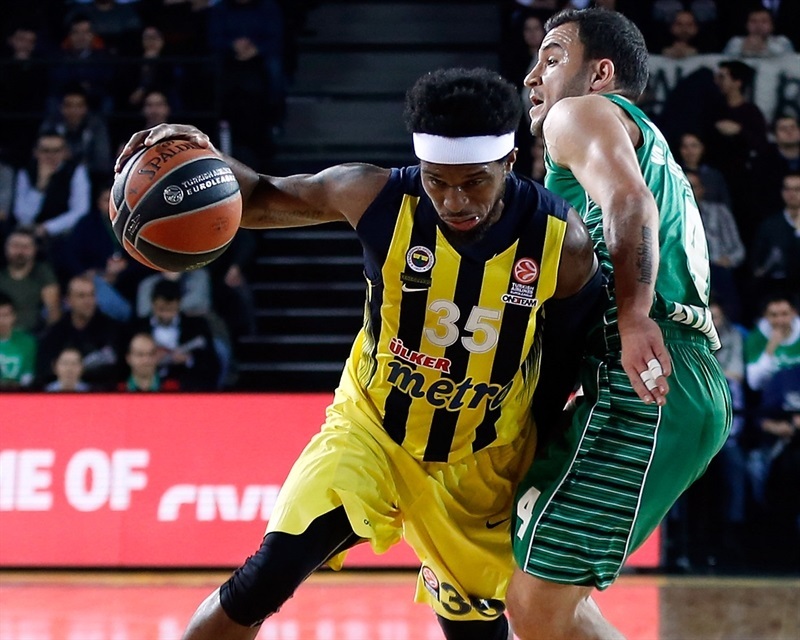 The hosts rode a red-hot Bobby Dixon, who made 5 first quarter threes, and the all-around brilliance of Jan Vesely in scoring 37 first quarter points. 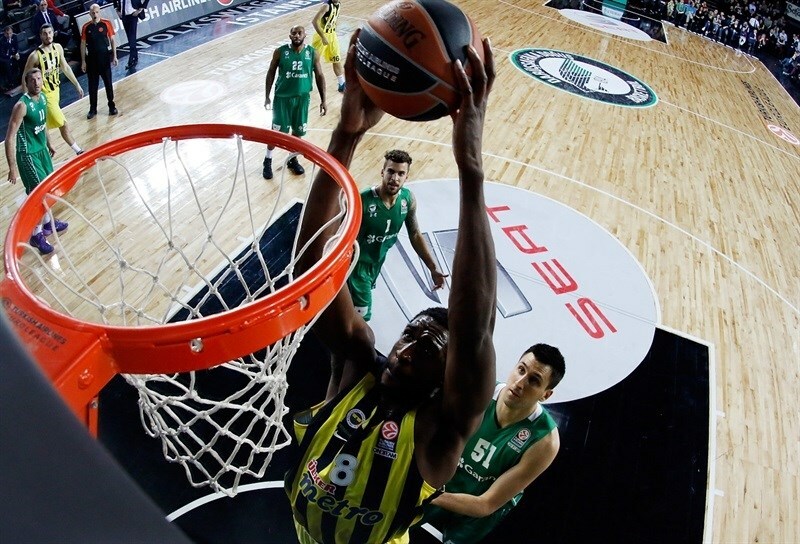 Fenerbahce lead by double figures throughout the first half and boosted the lead to 19 with Ekpe Udoh dominating inside in the third quarter. However Luke Harangody led a furious Darussafaka comeback to get within 3 in the final minute. In the end, Udoh and Dixon iced the game from the line. Dixon finished with 24 points, Udoh tallied 21 points and 7 rebounds and Vesely recorded 16 points and 13 rebounds for his third double-double of the season. 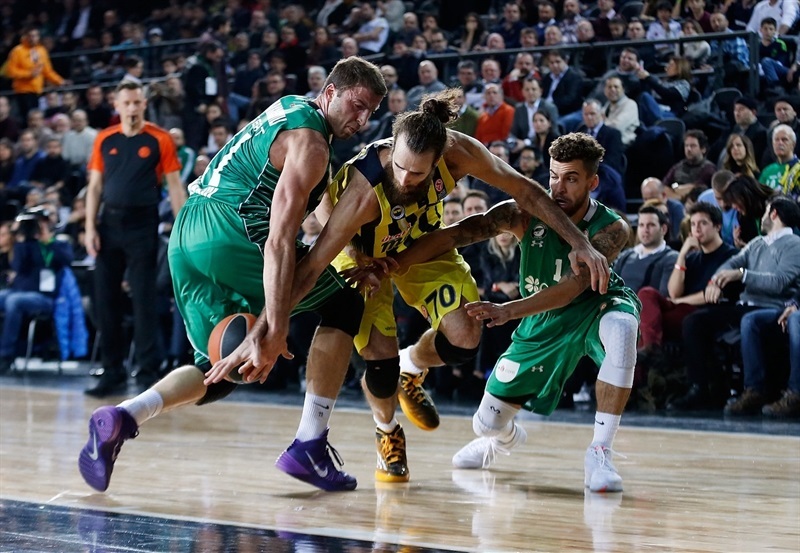 Luigi Datome added 14 points and Bogdan Bogdanovic 12 for the winners, who made 11 of 20 three-point shots (55%) and outrebounded the hosts 25-38. Harangody led Darussafaka with 22 points, Ender Arslan scored 17 in 16 minutes, Semih Erden and Jamon Gordon added 12 points each and Emir Prledzic had 10. Udoh drew a double team and hit Vesely for a layup and the game’s first basket. Erden also drew attention and assisted Harangody before Vesely rattled the rim with a dunk after he missed his first shot. Erden countered with a highlight-reel slam and Reggie Redding added a layup-plus-foul for the hosts’ first lead, 6-5. Back-to-back threes by Dixon and Datome put the visitors ahead. Mehmet Yagmur drove and founf Erden for a slam. Bogdanovic netted free throws before Harangody scored via goaltending. 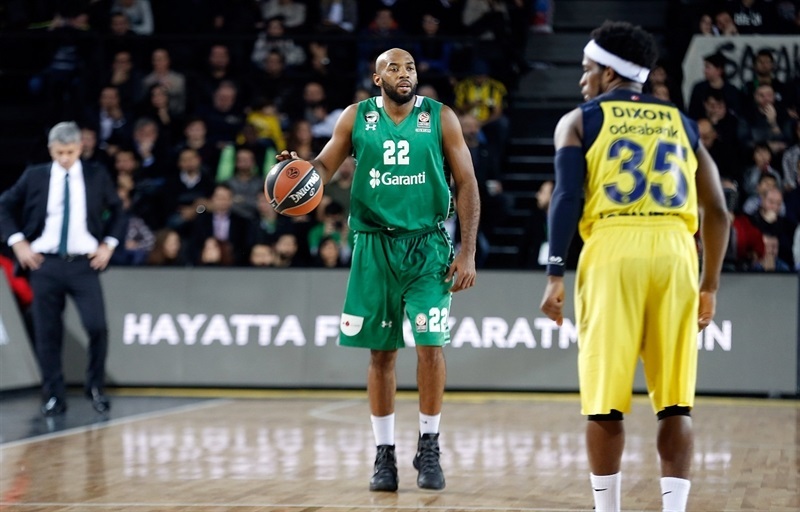 Dixon silenced the crowd when he picked up a loose ball with the 24-econd clock about to expire and heaved a three in off the backboard from the Darussafaka logo. Bogdanovic added a jumper for a 10-18 advantage midway through the opening quarter. Manu Markoishvili hit from downtown for the hosts, but after the TV timeout, Dixon and Bogdanovic each knocked down threes to stretch the difference to double figures. Scottie Wilbekin came off the bench and scored, but Dixon fed Udoh for an alley-oop slam to keep the visitors cruising. Gordon drove for a bucket only to see Dixon counter with his fourth triple for a 17-29 advantage. Dixon soon added his fifth! Gordon hit a mid-range jumper and Markoishvili buried a long jumper. A Wilbekin triple closed the gap to 9, but Udoh dunked again and Nikola Kalninic ended the quarter with a layup that made it 24-37. Gordon went through the lane for a layup, but Udoh dunked again for Fenerbahce. Arslan hit a jumper and then traded threes with Pero Antic. After free throws from Hickman and Milko Bjelica, it was 32-44. Vesely shined with a tip-in and foul. Gordon buried a jumper before Kostas Sloukas nailed a three. Arslan came through with 5 straight points, but after a timeout, Vesely rejected Gordon on the break and scored his own 10th point to make it 40-52. Udoh scored over Gordon before Erden maneuvered his way past Udoh for a score. Udoh sank free throws, but Harangody took an offensive rebound, scored and drew a foul at the other end. Vesely countered with a put-back slam, but Arslan found room for a layup and Erden split free throws to narrow the gap to 10. After free throws by Datome and Erden, Bogdanovic hit a jumper from the elbow. Erden beat the halftime buzzer with a jumper to make it 51-62. Dixon made a jumper for his first shat that wasn’t a three in the game. Udoh boosted the difference to 15 with a baby hook shot. Dixon swapped threes with Gordon. Datome sank free throws and Vesely hit a jumper, but Harangody nailed a three in between. Harangody scored inside and Redding stole the ball and split free throws to make it 60-73. Udoh buried a jump hook. Arslan remained hot with a baseline floater, but Udoh scored again inside to push the lead to 17. Prledzic scored his first basket for the hosts, but Boganovic countered with a smooth move. Preldzic split free throws before a Datome score made it 65-84. 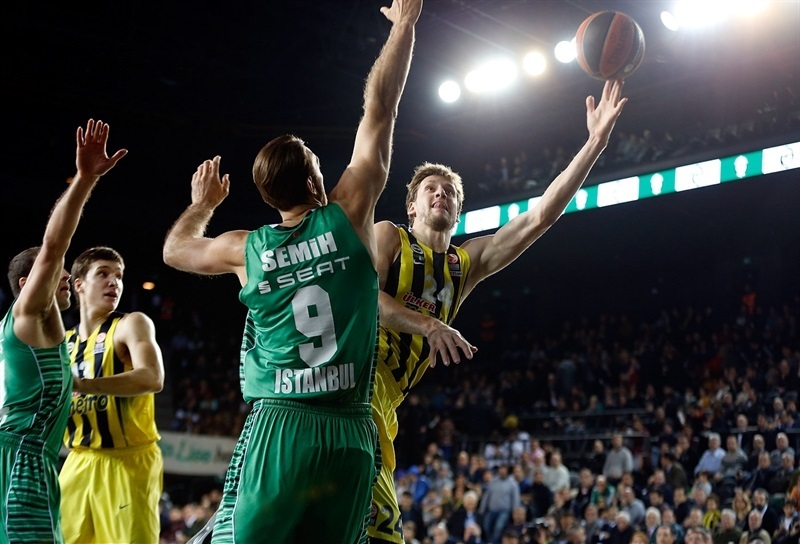 Arslan drained another three and Bjelica sank free throws, but Vesely scored inside. The third quarter didn’t end until Markoishvili’s triple made it 73-86. 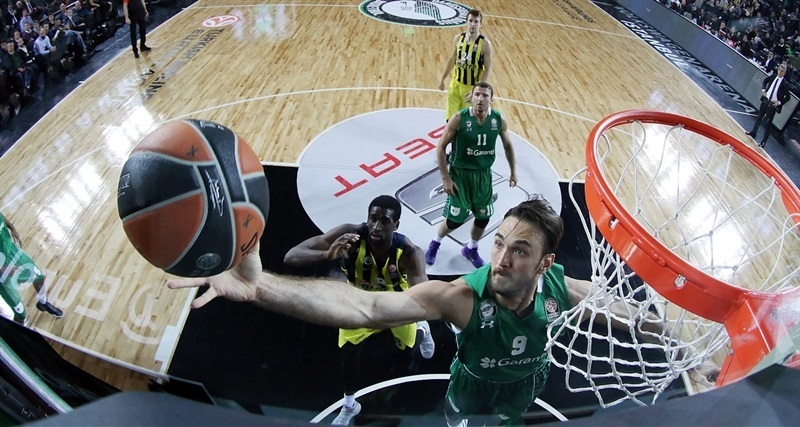 Datome sank a foul-line jumper and Dixon danced through the Darussafaka defense for a layup. Bjelica and Preldzic free throws and a Preldzic put-back made it 78-90. A well-rested Udoh came off the bench and scored his 20th point on the offensive glass, but Preldzic gave the hosts hope with a three-pointer and another free throw to get within 82-93. 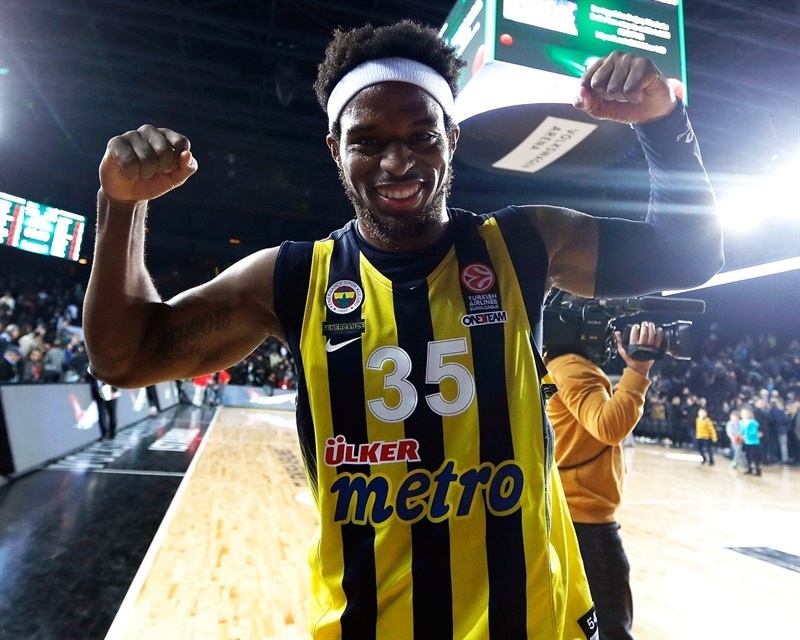 Melih Mahmutoglu became the sixth Fenerbahce player to make a three, but after Udoh missed twice from the line, Yagmur converted a three-point play and Erden blocked Bogdanovic. Erden missed twice from the line, but Harangody made it a 9-point game with a reverse layup. Hatangody then bettered a Mahmutoglu jumper with a three-pointer to make it 90-98. 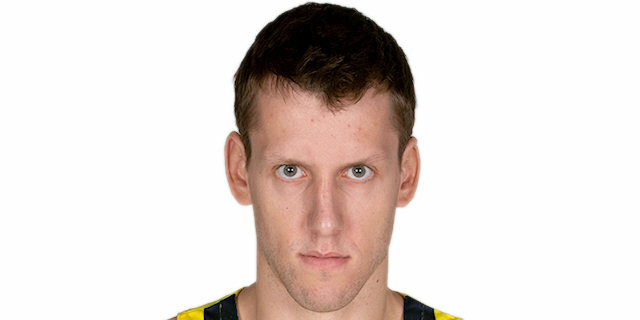 Sloukas brought Fenerbahce to the 100-point mark with free throws. Vesely fouled out, Erden sank free throws and Markoishvili drove for a tough layup. Then Harangody battled for a bucket on the offensive glass to bring the hosts within 4 with just over a minute remaining. Datome scored a tough three-point play, but Harangody came through with another basket followed by a steal and layup to bring his team within 100-103. After Udoh split free throws, Feenrbahce’s defense denied the home team and Dixon iced the game from the line. "We played against a very high-quality team. Congratulations to Fenerbahce for their win. They had a very solid outside shooting game tonight. We were in some sort of shock in the first quarter and we conceded 37 points. Then it was very hard to break their rhythm. You don’t normally expect that kind of high score game in the Euroleague. The good side of the game is that we fought until the end of the game with our heart. We even cut the gap to just one possession. But it was Fenerbahce who deserved the win today." "That was an important game for us. In my opinion people started too much to talk that we are favorites and everything is easy for us. 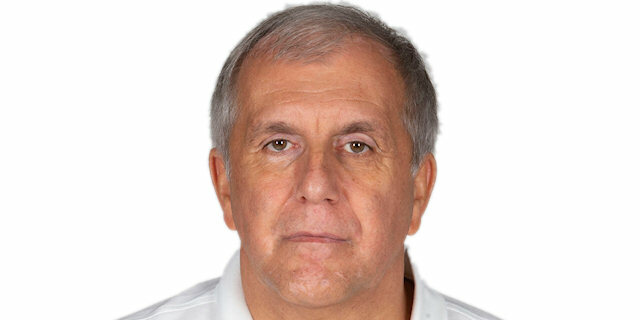 But we must be more realistic and there will be no easy game in the Euroleague. 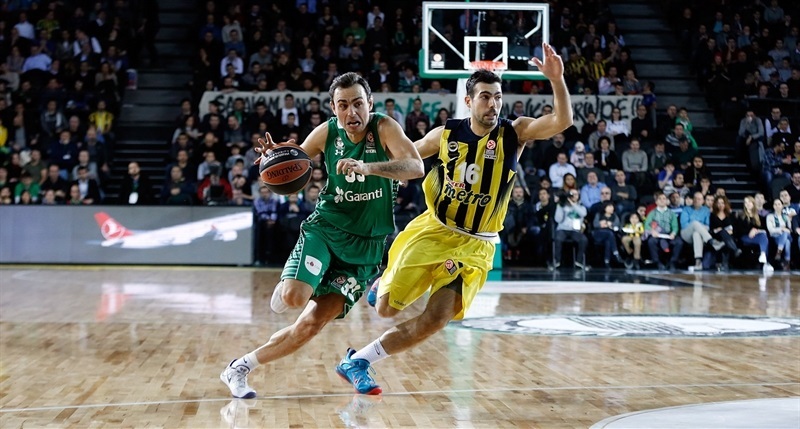 Darussafaka Dogus played with big motivation. That’s very important in our job. It was a very nice game for the spectators. The final score was 106-100 and everybody likes to watch a game like that. Sometimes you play an excellent offensive game, sometimes you win the game thanks to defense. Anyway you must find a way to win the game. The problem is that how we did come to that situation despite leading and controlling during the whole game. This is something we have to carefully analyze." "It was a bizarre game. We came out so stark. They scored 62 points at the end of first half. We clawed our way back in. We had some chances to win. We brought the energy at the end of game. We should’ve done that during the whole game. We didn’t have energy left after we closed the gap. But we didn’t deserve after the start we had and the points we gave up." 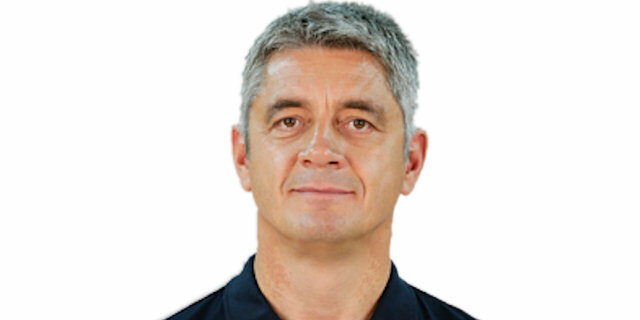 "First of all I’d like to congratulate Darussafaka Dogus for a good game. They played very hard and they stayed in the game until the very end of regulation. They were very tough. From our point we just stopped playing towards the end of the game. I just want to play for the team and help the team to win the game. I’m not looking for personal statistics. "